Movie Reviews, Essays, Lists, Advice, Interviews. Also a Podcast! I saw the new Godzilla yesterday. 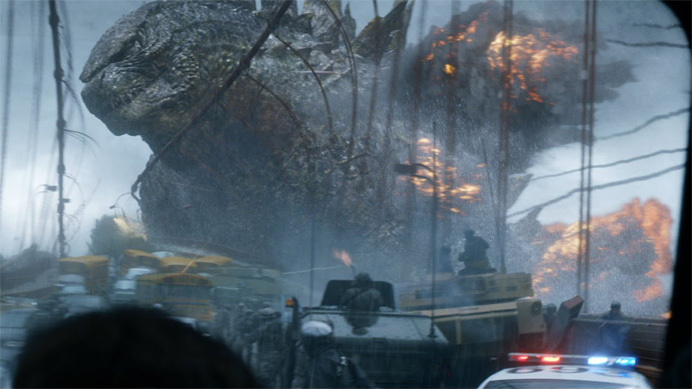 I enjoyed it a lot, but I’ve been weirded out for months over the fact that I’ve had to call it something I’ve never had to call a Godzilla film. Just like how I recently had to call a Bond film something that, in 50 years of recasting and returning to ground zero, I’ve never had to call a Bond film. I’m all for specialized vocabulary. Film needs its own exclusive words to describe its own processes, but ‘reboot’ is not such a word. I’ve asked people time and again to define it, and I’ve read about it online—god help me, I’ve even read the Wikipedia page for it. It’s just not a real and distinct concept. It’s a cheap marketing buzzword, that’s all it is. And more than that, the very existence of the term is symptomatic of a rot at the core of contemporary filmmaking. What is a reboot? Well first of all, let’s look at what a remake is. A remake is a retelling of a story already filmed. That’s it. A remake can follow closely to its predecessor’s footsteps, such as John Huston’s The Maltese Falcon, which is almost line-for-line the same film as the 1931 version but with the added value of world-class actors like Humphrey Bogart and Peter Lorre. Or a remake can jackknife wildly in a new direction, like Herzog’s Bad Lieutenant: Port of Call New Orleans, which relocated Ferrara’s original and injected it with an acerbic ridiculousness. A remake can sometimes even restore a film to the roots of its original source material, like John Carpenter’s The Thing, which brought back the shapeshifting aspect of the original story, something the 1951 version wasn’t capable of doing. These are all remakes. We call them that. We’ve been calling them that for longer than I or most people reading this article have been alive. The term ‘reboot’, on the other hand, seems to have snuck into our lexicon around 2003, with the releases of The Texas Chainsaw Massacre and Battlestar Galactica. 2003‘s Texas Chainsaw Massacre was surprisingly not terrible, a glossy retread of the original masterpiece. It was called a ‘reboot’ because it stripped away all the characters and events of the previous films, the idea being that it was ‘returning’ the series to its ground floor. That’s all well and good—except for the fact that the characters and events of the previous films ignore each other too. The Texas Chainsaw movie that immediately preceded the 2003 remake was Texas Chainsaw Massacre: The Next Generation, a terrible, no-budget remake which ignored all of the prior films (and starred a pre-fame Matthew McConaughey and Renée Zellweger). Before that, Leatherface: The Texas Chainsaw Massacre III was a kinda-sorta sequel and kinda-sorta remake of the second film, lumping in characters introduced in that film who even died in that film. And Texas Chainsaw Massacre 2 is infamously different in tone from the first film. In short, 2003’s Texas Chainsaw Massacre was saddled with a new word describing a ‘new concept’ that had already been done, as a rule, throughout the entire series, and for that matter, throughout most other slasher franchises—the Friday the 13th films never even pretended to have what we now call ‘continuity’ until the fourth one. The term ‘reboot’ for Texas Chainsaw 2003 seems only to exist to make clear, from a marketing standpoint, that the film has a different spirit that its immediate predecessors, and is a return to the uncompromising meanness of the original. In truth, it’s just a dressed-up word for a remake. Around the same time, the Edward James Olmos-led Battlestar Galactica aired, pitched in magazines and press pieces as a “re-imagining” and a “reboot” of the original series. This was a major signal here, assuring us that it wasn’t campy and clunky like the ‘70s show. And it wasn’t. I love Battlestar—it took a great premise that was squandered in the 1970s and explored it to its limits. But isn’t that what a remake is expected to do in the first place? Isn’t that what The Maltese Falcon does? Isn’t that what the 1978 Invasion of the Body Snatchers does? The original version of Body Snatchers is a masterpiece, but the ‘70s version is able to openly explore sexual and political undercurrents that, in the 1950s, had to stay buried. A frustrating aspect of ‘reboot’ is that it converts the word ‘remake’ into a pejorative, meaning something akin to ‘a film that retreads the same ground as its predecessor’. Are we then to accept that what J. J. Abrams did to Star Trek is more radical than what Yasujiro Ozu did when he merely remade his silent film The Story of Floating Weeds in color, with sound? Previous Star Trek films may not have had as exceptional special effects budgets, but they damn sure all had audible dialogue. Star Trek is a great reminder that the word reboot only concerns itself with the remaking of a franchise rather than an individual story. And that’s your first clue that something is amiss—the concept of a ‘franchise’ as a bare root of storytelling is at an insidious high now, and it’s a problem. Filmmakers shouldn’t think in those terms, because once you start considering your film as the beginning of an assumed trilogy or saga, you start to hold things back from the audience. This leads to ‘worldbuilding’ instead of filmmaking. Worldbuilding is what stretched a 300-page kid’s book called The Hobbit into a bloated carcass dutifully drifting into theaters every few years, longer now to watch than to read. Worldbuilding is why the Spider-Man movies can’t get off the ground, why they keep insisting on telling the same story over and over. Hell, worldbuilding is probably what caused Marvel to kick Edgar Wright off his dream project Ant-Man. If the generation that learned filmmaking from Star Wars had made Star Wars, they’d have saved the Death Star for the third movie. By drawing a line between ‘reboots’ and ‘remakes’, we as film viewers are perpetuating the idea of a franchise as a matter of course rather than an audience’s reward for stellar filmmaking. ‘Reboot’ is nothing more than a sneaky way for a movie to give itself a bit of grandeur it hasn’t necessarily earned, and we shouldn’t allow marketing departments to win this one. By adding ‘reboot’ to our lexicon, we accept a sneaky little subjective term in as an objective descriptor. We saddle films with weird obligations, and we are hardly conscious of it as we do so. We are not expanding the boundaries of how we talk about movies by throwing around the word ‘reboot’—we are shrinking them. This entry was posted in All Posts, John's Essays and tagged abel ferrara, ant man ant-man, bad lieutenane, battlestar galactica, edgar wright, friday the 13th, godzilla, godzilla 2014, humphrey bogart, invasion of the body snatches, j.j. abrams, john carpenter, john d'amico. movie reboot, john damico, john huston, maltese falcon, matthe mcconaughey, movie reboots, movie remake, movie remakes, peter lorre, port of call new orleans, remakes, renee zellweger, smug film, smugfilm, spider-man, spiderman, star trek, star wars, texas chainsaw massacre 2, texas chainsaw massacre: the next generation, the hobbit, the maltese falcon, the maltese falcon 1931, the story of floating weeds, the texas chainsaw massacre, the thing, the thing from another world, werner herzog, yasujiro ozu. Bookmark the permalink. I’ve been thinking about much of the same thing lately, though I could never put it quite so eloquently. Unfortunately, considering it’s already getting used for ‘franchises’ that only consisted of one movie or less, I get the feeling that this war has already been lost. It’s simple. Robocop gets a remake. Spider-Man gets a reboot. Most movies are meant to launch franchises and reboots are very explicitly for that purpose. In the case of TCM, it’s to show that the movie can abandon the past few entries of the series to embrace a vision more in line with the original. A show of good faith to the audience that the series is now in capable hands, and you can forget about the rest of it. Series filmmaking is just a reality of the current state of Hollywood, and I don’t think that that’s a problem necessarily (serials go back to the silent era, people have a basic appreciation for continuing narratives), so long as every movie is a worthwhile piece all its own. Unfortunately, lot of the more mediocre Avengers or Spider-Man movies are allowed to coast on their continuity, with the audience needing to see them before they can watch the next. The new X-Men does some really interesting stuff with it, because it’s basically about jumping through hoops to totally dismantle everything that’s occurred in the series. I don’t understand this at all. What difference are you referring to? Glad you liked Godzilla ’14! Technically Godzilla’s been rebooted before, but those were made before ‘reboot’ became a thing. Which, as you say, it shouldn’t be. I like ‘the idea’ of reboots. I’d love to see more movies that explore old ideas in different ways without their old baggage. Its current context is silly though, you’re right. It’s just a marketing word. As always, the idea the marketing sells is better than the truth. OK, I’ll take the challenge. A remake is an attempt to recreate a previous work, including most (but usually not all) of the same details (plot elements, characterisation etc), using newer film-making techniques. A reboot is an attempt to create a new work based on core elements of an existing work, while changing a majority of surrounding elements, and applying not just modern film-making techniques, but also modern tropes. A shortened answer would be that at remake tends to include a lot from the original, while a reboot tends to indirectly reference a lot instead. As good as set of definitions as I’ve seen, but why didn’t we need a word like that to describe Carpenter’s The Thing, Kaufman or Ferrara’s Invasion of the Body Snatchers, or, hell, even Fassbinder’s Ali: Fear Eats the Soul, which is jammed full of references to All that Heaven Allows? I feel like a ‘reboot’ usually implies a long running series, too. That might be what’s missing from the above analysis. A reboot implies that the old way of doing things for a franchise is running out of steam, so they want to hit the reset button on it and come at it again with a new approach. Anyway, to me a reboot has always meant a re-imagining of an existing franchise (which usually has gone through at least a few releases), which is at liberty to ignore any old elements as needed and bring in new ones. A remake is an attempt to tell the same story, in more or less the same way, but with modern techniques. I think the distinction is useful, but frequently misused. Isn’t it impossible to really reboot anything? People will always remember what came before, and see the new thing as a remake. Unless nobody saw what came before, like with those Fantastic Four and Captain America live action movies from the early 90’s. Or like with that movie September that Woody Allen shot, edited, then decided he was unhappy with and reshot it with an entirely different cast. That seems like a more accurate definition of a reboot, because you’re literally scrapping the previous thing. In the context of works people are already familiar with, it doesn’t really make sense. In my example it would at least have a useful and objective meaning. I’m not sure language is ever about what we need, just what we use. As the medium gets older, and ground retread more frequently, it’s not surprising we’ll start creating words to describe particular ways that that’s happening. That’s a fair and interesting point, but here I think is an exception. Here’s a case where we should actively fight that. “Reboot” is like a language virus, it’s something that was invented in a boardroom to sell things to us. and you are right, reboot is gimmicky and lends itself to world-building as you say – but you have to remember this appears to be the point of these films. That is their business. Inversely you could say this term is completely apt. And do you consider Nolan’s Batman to be remakes of the Burton films or are they are a completely different story?